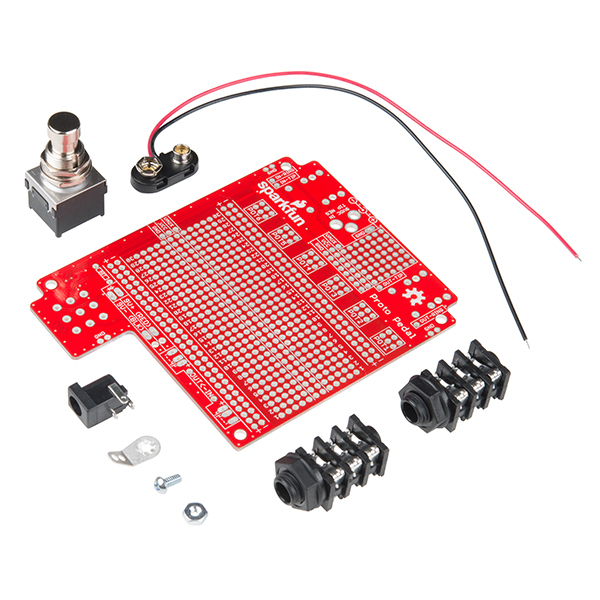 The SparkFun Proto Pedal is an easy-to-assemble kit that makes building guitar effect pedals easier. Let's face it, most guitar pedals start with all-too-similar circuitry – you need the input and output jacks, the bypass switch, and a barrel jack for power input. In some pedals, there may be as much wiring involved in the jacks and switch as there is in the effect itself. 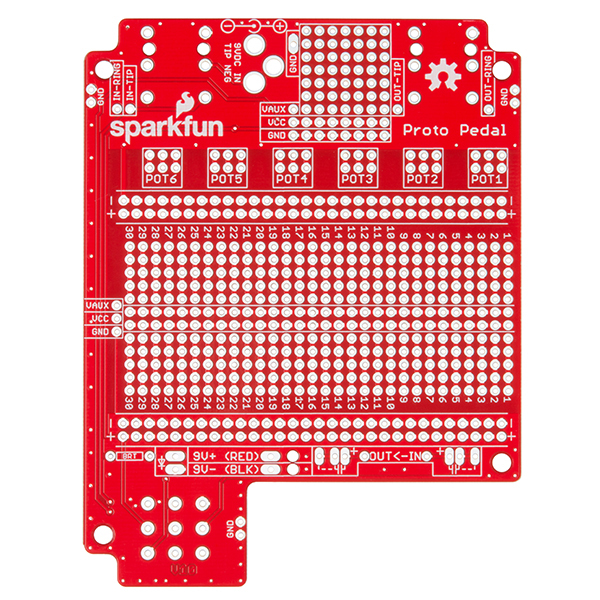 The SparkFun Proto Pedal takes care of the hard part and provides you with a simple infrastructure; all you need to do is decide what simple circuit to make to gain your desired effect, and you'll be ready to rock! With the SparkFun Proto Pedal you'll find all the problems of a guitar pedal's complex framework solved with true bypass and LED switching; a large, open prototyping area equivalent to a standard solderless breadboard; a small prototyping area for power regulation or reference voltages; and six positions to help organize potentiometer wiring. To make your life even easier, not only have we written a complete assembly guide for the Proto Pedal; we have also written two effect circuit guides that utilize the board's large prototyping area. All of these guides can be found in the Documents section below. Each Proto Pedal comes as an easy-to-assemble PTH soldering kit, and it’s up to you to solder it all together! 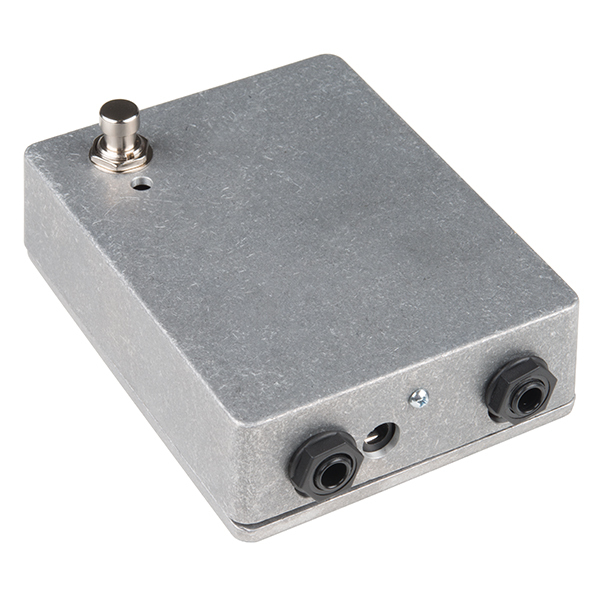 Additionally, we highly recommend using the Proto Pedal Enclosure with this kit. It’s a standard-size cast aluminum box, which does double duty as an assembly jig to help get the jacks and switch aligned correctly. We did NOT include the enclosure with the Proto Pedal to help keep the kit affordable -- and in case you already had an enclosure you wanted to use or create yourself. 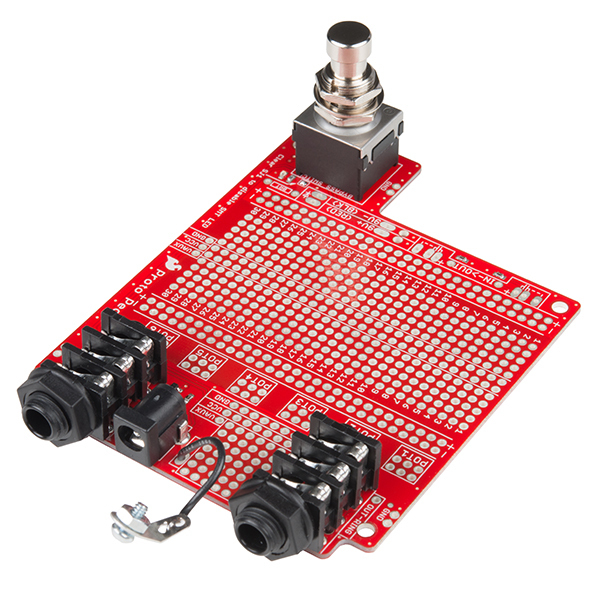 2x Stereo Audio Jack - 1/4"
On Sparkfun images, there is TWO nuts for switch to tight it up correclty to proto case (https://www.sparkfun.com/products/13967). But I ordered two of these kits, both switch packs has just ONE nut. So? What is going on on these? We had a mistake in our packaging process that caused the first 50 units to go out with only one nut. We are working to proactively contact and send out replacement nuts to everyone that is effected. Thank you for bringing this to our attention. 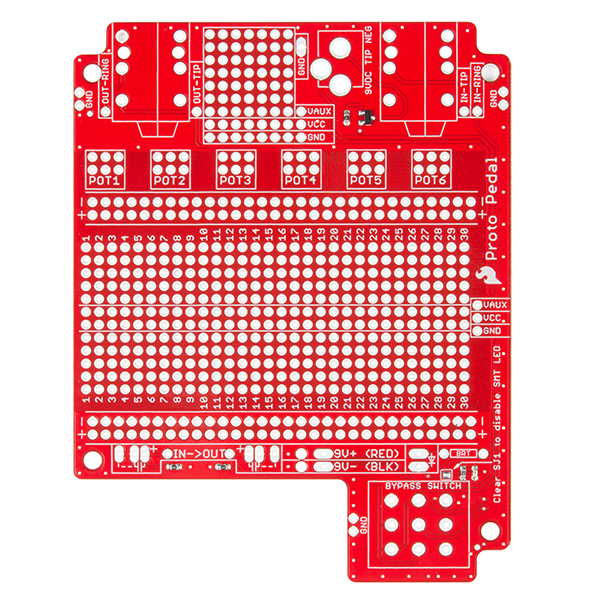 Does Sparkfun sell this footswitch by itself anywhere? I can't find it. 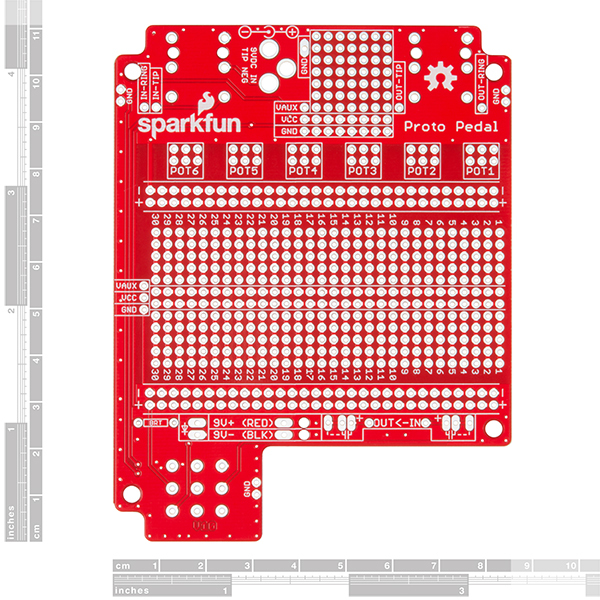 Any plans for a 125B sized proto? My colleagues and I have spitballed the idea of adding an extra degree of control by putting an accelerometer in the chassis, maybe something like the ADXL345, which offers tap detection. You could just tape the box with your toe, rather than requiring another switch. It would be fun to build a 'spring reverb' clone that twanged when you kick it, just like the real thing. There's the part if you want to look elsewhere. Then it's just solder and drill a new hole in the enclosure. You can add pots and switches and LEDs galore! And here's why...it's because it is awesome!